Did you know Yulu PR has been B Corp certified for going on four years? B Corp certification (regulated by the nonprofit B Lab) involves rigorous yearly assessments that measure social factors such as employee benefits, environmental footprint and transparency. A friend from the Vancouver B Corp community once described CSR as the good companies have to do, compared to B Corp certification as the good they want to do. The philosophy surrounding CSR is that companies should consider the impact they’re having on their broader community and do good in some way (often to offset the net-negative impact they have from putting profits above all else). CSR tends to involve check writing, whereas B Corp certification involves a sustained and ongoing look at a your company’s impacts on people, the environment, and the global community. 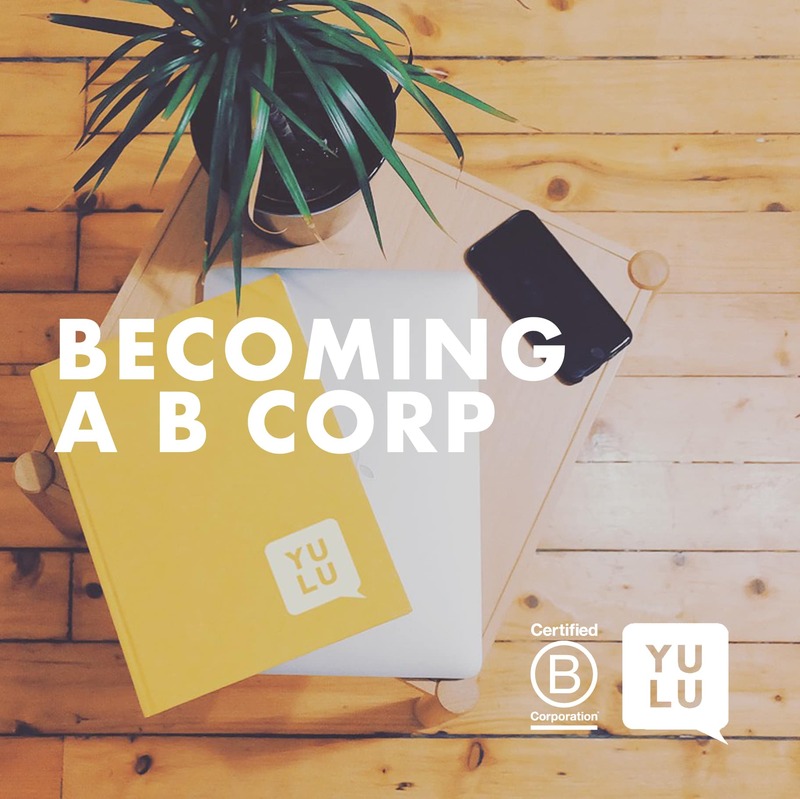 In addition to having to pass a rigorous assessment each year, becoming a B Corp gives you access to a both a global community and a close-knit local one. Most major cities have a B Local monthly meet up, where a different sustainability or social impact topic is discussed. Beyond the typical networking event (groan), B Local gives B Corps a chance to get to know their like-minded neighbors and form committees, help plan for events and challenges, and to educate one another. One such challenge is the Inclusive Economy Challenge, which seeks to level the playing field for employees of all backgrounds and challenges. Some of the ways B Corps are stepping up: offering interest-free loans to employees for major purchases, increasing the diversity of their Board of Directors, incorporating diversity and inclusion into their hiring guidelines, and offering more family friendly policies such as caregiver leave and flexible working options. Companies that aren’t hiring at the moment are taking the opportunity to get educated on Reconciliation, accessibility and inclusion. Not too long ago, this statement would sound awfully Pollyanna-ish, but the public is demanding more from the companies it patronizes. There are more than 2,400 certified B Corps in 130 countries around the world. Those in the UK are growing at 28 times the national average. Amidst turbulent political times in the U.S., brands are increasingly weighing in on social issues like immigration and gun reform. Even major corporations like Unilever, for whom certification might seem incredibly complex and far off, has looked to B Lab to help assess its impact. Interested in learning more about attaining and leveraging B Corp status? Drop us a line at hello@yulupr.com.